The arts are alive in Greenville in November; just take a look at the Fine Arts Center Events calendar! 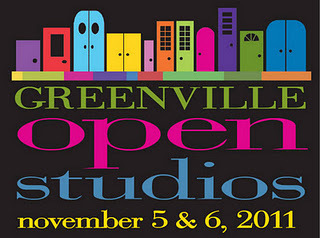 This weekend will be an eventful one off-campus, as well: Greenville Open Studios will be taking place all over Greenville County. Fine Arts Center students are encouraged to visit the artists in their studios to get a glimpse of the visual arts in process. There are more than 120 artists in various media involved in this year's event! In addition, Fine Arts Center and ARMES performing arts students will be showcasing their talents this month in several recitals. Come listen! November is also the month when prospective Fine Arts Center students will have an opportunity to visit the Fine Arts Center to observe classes and learn more about the curriculum. Interested students should visit the home page for more information. No doubt events will continue to be added to the calendar as the month progresses. What more could you ask for?